The Wanaka Selection is a portfolio of stunning central holiday homes all located in the heart of Wanaka. 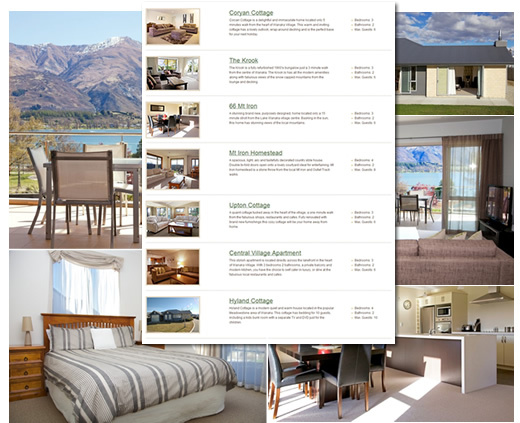 The Wanaka Selection is a mix of cosy cottages, exclusive apartments and modern stylish houses. All of the wonderful accommodation choices are furnished to a high standard and have all of the amenities you require. The homes have been carefully put together to ensure they are family friendly yet luxurious homes away from homes. The houses all have a minimum of 3 bedrooms and all have multiple bathrooms. The kitchens are fully equipped and the lounges are warm, comfortable and spacious. The Wanaka Selection team can work with you and your families to ensure you are matched with the perfect property for your stay in Wanaka. We assist you with location, amenities, budgets, along with any other optional extras you may require. A perfect option for friends and family attending your wedding is a Wanaka Selection Holiday Home.